This page is a blog article in progress, written by David Tanzer. Here is the Forum editorial discussion for this article. Here are the Forum content notes for this article. A set of objects Ob(OO). For objects X 1,...,X n,YX_1,...,X_n,Y, morphisms_ ϕ:X 1,...,X n→Y\phi: X_1,...,X_n \rightarrow Y. The set of all morphisms of type X 1,...,X n→YX_1,...,X_n \rightarrow Y is written Hom O(X 1,...,X nHom_O(X_1,...,X_n. The head of the tree is hh. The first child of hh is ff. That is because the output of ff is the first input to hh. Similarly, the second child of hh is gg. The composite morphism will map A,B,C,D→YA,B,C,D \rightarrow Y. In the technical construction of an operad, the composition rule is defined just for two-level trees, such as the one above. Then, in order to ensure that it can be uniquely extended to a rule for all trees, the associativity condition is imposed as a requirement on the composition rule. Equivalently, one could start by defining a composition rule for all tree diagrams. Then, the following associativity constraint would be imposed on the rule. Suppose you had a tree of morphisms TT, with child trees T 1,...,T nT_1,...,T_n. Let T′T' be the tree whose root is the same as TT, with children U 1,...U nU_1,...U_n, where U iU_i is the composite of T iT_i. Then the composite of T′T' must equal the composite of TT. In other words, the composite of a tree must equal composite obtained by first collapsing – through composition – each of the child subtrees. 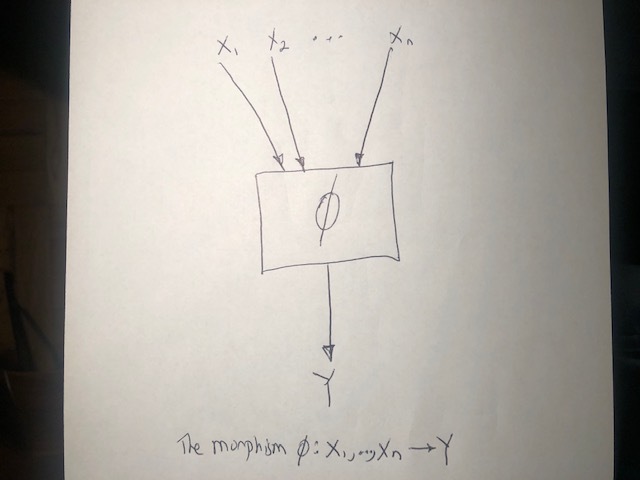 The identity morphism Id A:A→AId_A: A \rightarrow A for object AA is defined by the requirement that it is a ‘no-op’ with respect to composition. This means the following. Suppose TT is a morphism tree, which contains Id A:A→AId_A: A \rightarrow A as a subtree. Let T′T' be the result of ‘splicing’ Id AId_A out of the tree. Then it follows that the identity morphism for AA must be unique. For suppose that there were two identity morphisms I 1,I 2I_1,I_2 for AA. Consider the linear tree which chains I 1I_1 into I 2I_2. The result of splicing I 1I_1 out of the chain is I 2I_2, and the result of splicing I 2I_2 out of the chain is I 1I_1. By the identity requirement, these must be equal. We illustrate for n=2n=2, which gives the ‘little squares’ operad. There is just a single object □\square, which serves only as a placeholder. The entire content of this operad consists of the morphisms from □ 1,...,□ n→□\square_1,...,\square_n \rightarrow \square. Note: the subscript on □ i\square_i is only for counting purposes. They’re all the same object. The morphisms are geometric arrangements. Choose some fixed ‘outer square,’ which for concreteness we take to be the unit square. Then a morphism f k:□ 1,...,□ k→□f_k: \square_1,...,\square_k \rightarrow \square is an arrangement of kk subsquares within the outer square. Now, can you picture the natural rule for composing a connected tree of arrangements into a composite arrangement? Here is the picture, painted with words. Let ff be an arrangement of kk subsquares s 1,..s ks_1,..s_k within the unit square. Let w iw_i be the width of square ii. Suppose that we are given arrangements g 1,...,g kg_1,...,g_k which we wish to compose into the structure given by ff. The interpretation of this will be to nest each g ig_i as a sub-arrangement of ff, installing it at the site of s is_i. s is_i will function as a frame for the installation of a scaled-down copies of the subsquares comprising g ig_i. In particular, the subsquares of g ig_i will get scaled down by the factor w iw_i before being installed into the frame s is_i. So now, on our mental ‘workbench’ we have the unit square, subsquares s is_i, and sub-subsquares (which have been scaled down). The final composite is defined by discarding the intermediate subsquares s is_i, and just retaining the outer unit square and the scaled down sub-subsquares. For example, let f:□→□ 1,□ 2f: \square \rightarrow \square_1,\square_2 be the arrangement consisting of the lower left and upper right quarters of the unit square. The consider the morphism tree consisting of ff at the root, with two children that are also ff. The composite of this tree will be the first iteration of recursively nesting ff within itself. It consists of four subsquares, each of length 0.25, arranged along the diagonal from the lower left to the upper right corners of the unit square. Little n-cubes is a “primordial operad” that clearly illustrates the general spirit and intent of a wide range of applications of operads. Objects conceived as interfaces, and a morphism X 1,...,X n→YX_1,...,X_n \rightarrow Y is conceived as an arrangement of the sub-interfaces X 1,...,X nX_1,...,X_n within the enclosing interface YY. Composition of morphisms is the operation of nesting arrangements and removing the intermediate interfaces. A tree of connected morphisms can represent a decomposition of a system using a hierarchy of abstractions. Composition of the morphisms gives the opposite process: concretization, to give an arrangement that explicitly includes all of the most granular components in the system. For instance, an abstract design for a complex machine may include components like Fast Fourier Transform, Convolution, and so on. Operad morphisms can describe the decomposition of the system into subcomponents, along with their detailed interconnections (wiring, or software ‘plumbing’). In a hardware interpretation, the composition of the hierarchy of morphisms can yield a detailed circuit diagram comprising a large number of elementary logic gates. There is much more to be said on this subject, which is both elegant and applied. Azimuth Forum content notes for this blog series. Stop by to discuss!